Coffee and tea are an integral part of our culture and our lives. Worldwide retail coffee sales exceed $75 billion while tea sales account for more than $40 billion. Competition in this beverage category is intense so creating the right retail POP display is critical to driving sales. Let’s take a look at 8 very different coffee and tea displays that were designed to meet a diverse set of budgets and objectives. We designed this economical single-serve wire counter tea display for Honest Tea. While it is not very fancy, it accomplishes a few important objectives: (1) It utilizes a minimalistic wire design to put the focus on the product; (2) It provides an opportunity for strong branding by virtue of its digitally printed PVC header sign; and (3) It is extremely cost effective. We designed this 5- shelf, 1-sided sheet metal floor display to hold 40 bags of coffee. The display is constructed of a sturdy metal base with slotted dual uprights, and adjustable sheet metal shelves with wire fencing to hold in the coffee bags. What really works about this display is the strong branding which appears on the logo plates on the front of the shelves, header sign, and the flag sign. 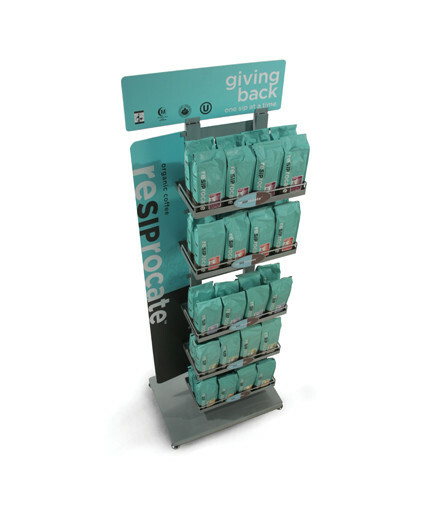 The graphics help to promote the “Resiprocate” Giving Back campaign while also inviting the shopper to give their coffee a try. A number of our customers have selected our stock WD-24FL-P display and customized it for their coffee product. This is just one example of how it is easy to take a generic stock display, add custom side and header signs to end up with a relatively high capacity, prominently branded, attractive and cost-effective floor display. The display can accommodate further branding by adding shelf signs. Not only is this coffee display cost effective to purchase, but its knock-down construction makes it relatively cheap to ship. This 4-shelf mobile floor display generated a whopping 500% increase in sales and paid for itself in just 9 days. 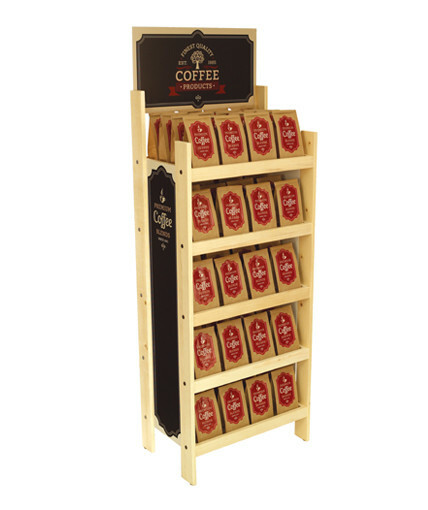 We did a mini-case study on this coffee display, which provided a 3400% return on investment. The display is constructed of solid pre-finished birch plywood and features eye-catching base, side, and die-cut header graphics. The 3D header graphics, along with the side graphics, help to tell the brand’s unique story which is based on the health benefits of the product. We manufactured this large island display to cross-merchandise bread and Starbucks bottled frappuccino. This coffee fixture required rugged construction that would hold up to high traffic in Wal-Mart stores. We constructed the unit of MDF with a hard rock maple melamine finish. We included heavy-duty castors that could support the weight of a fully loaded unit. We also included edge banding, heavy-duty bumpers, metal tubes for the top shelf riser and shelf tag molding. We used vinyl graphics on the sides to create Starbucks and Wal-Mart co-branding. We worked with Circle K to create a more permanent coffee bar which is pictured here without the brewing equipment. 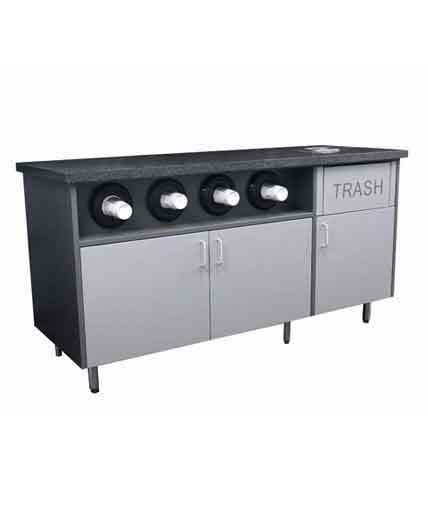 This modular coffee bar features MDF cabinet construction with lower storage compartments, laminated front and sides, solid surface top, trash receptacle and swing door, cup dispensers, and stainless steel legs. Our objective for the Coffee Bean & Tea Leaf fixture was to create a self-serve coffee kiosk to expand Coffee Bean’s presence in the supermarket channel. We designed a modular and configurable 6-ft. coffee kiosk which incorporated a solid-surface counter top, solid wood structure and cabinetry, metal fencing and accents, overhead lighting, direct-print graphics, dual menu boards, cup dispensers, condiment trays, and dimensional lettering. This permanent coffee fixture also incorporated a cooler for refrigerated coffee beverages, brewing equipment, a money changer, and electrical/plumbing connections. Like its larger counterpart, we created this 4-ft. self-serve coffee kiosk to fit in more standard 48” end-cap locations. The construction is virtually identical to the larger unit except for the elimination of the trash receptacle, some cabinet storage space, merchandising shelves, and one of the menu boards. 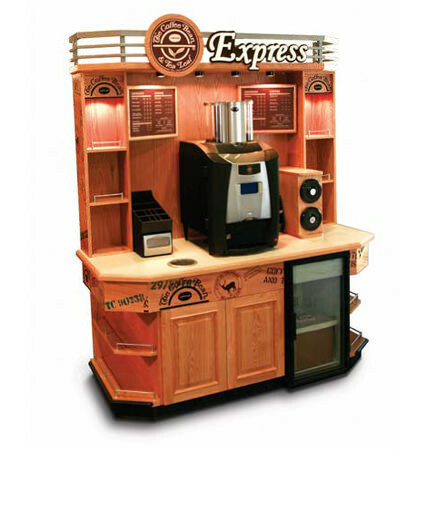 Even with a 2 ft. smaller footprint, this kiosk can accommodate a cooler, brewing equipment, a condiment holder and a cup dispenser.